To be honest, I hesitated about reading this book. I enjoyed The Gentleman’s Guide overall but I wasn’t blown away by it. However Beth’s review won me over, so I decided to give this a try. This book surprised me in a good way, and I am so glad to have read it! I’m excited to share my review with you guys today. 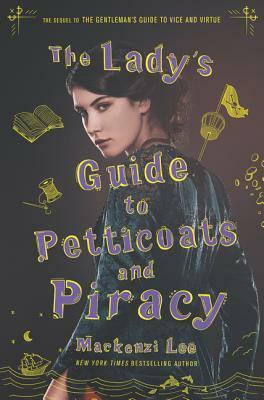 Note: Although this is a spoiler-free review for The Lady’s Guide to Petticoats & Piracy, it is possible that there are spoilers for The Gentleman’s Guide here. Please check out my previous review for The Gentleman’s Guide to Vice & Virtue! Felicity Montague was had always dreamed to be a physician, and despite her many petitions to medical schools, she was not accepted due to her being a woman. Rejecting the standard expectation to be a housewife, Felicity traveled to her estranged friend Johanna’s wedding to meet a doctor who could change her life. Felicity was strong-willed and determined, and she was not afraid to fight for what she believed in. I also loved the secondary characters in this novel as well. Having lost her mother at a young age, Johanna was now stuck in a marriage that she rather not be in. Sim was a mysterious young woman who wore the tattoo of a pirate ship, who agreed to help Felicity get to her destination though her motives were questionable. I loved the strong, motivated women in this novel and the relationships between them. It was inspiring and empowering to read about their journey and the hardships they’d overcome. I was also happy to see Monty and Percy make occasional appearances in this book! During Felicity’s search for a medical career, she stumbled upon medical and fantastical issues that were bigger than herself. This led to a change in her perspective on medical care and the men in the existing medical system. I loved that historical and imaginary elements were combined to create an engaging story. Although pacing was slow to begin with, once I had gotten to the second half of the story, I was hooked by the characters and the plot. Some plot elements took me by surprise in a good way. While Monty’s voice in The Gentleman’s Guide was light and humorous, Felicity’s voice had a more serious tone, showcasing her strength and resilience. I was actually annoyed by Monty’s jovial voice in the first book (because at times he seemed inappropriately jovial) however I loved Felicity’s voice in this novel. I grew to love the prose in this novel, especially setting descriptions and Felicity’s own introspection. I am often intimidated by historical fiction, however this novel incorporated historical elements in a way that was easy to understand and meshed well with the story and the characters. I also loved the sprinkle of fantasy elements which made this a delightful read. The ladies guide was a well-written, engaging and empowering novel featuring strong female MCs. Whether or not you enjoyed the first book in this series, I recommend you give this a try! Do you like historical fiction? How do you think about The Lady’s Guide? Have you read any sequels that you liked more than the first book in a series? Absolutely! I loved Felicity’s voice in this novel. She was so strong and independent and inspiring to read about. Johanna and Sim were also as well 🙂 I loved that all three characters were awesome female MCs that are great in different ways!